This sample price: priced within the past 7 days for arrival on Friday, September 6, 2019, departure from New York City (all Airports), NY. Choose your own departure city and dates. Paris is regarded as one of the most dynamic cities in Europe, and for good reason: the city assaults the senses; demanding to be seen, heard, touched, tasted and smelled. 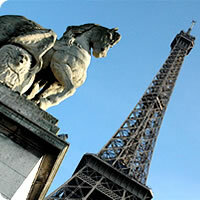 Gaze at impressive monuments and savor its gourmet cheeses, chocolates, wines, and seafood. Paris is relatively small as capitals go, with many of its major sights and museums within walking distance of each other. A world of discovery awaits in every hidden corner and at all the famous sties, there is so much to explore. Eiffel Tower, Louvre Museum, Arc de Triomphe, Notre Dame Cathedral, Jardin des Tuileries, Latin Quater, Avenue des Champs Elysees, Musée d`Orsay, Place de la Concorde, Arc de Triomphe and so much more! 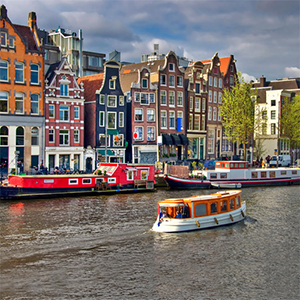 Visiting the Netherlands should mean more than Amsterdam. The vast flower fields, old windmills and bustling market towns make it an exceedingly pleasant place to explore. The Hague, Delft and Alkmaar are three cities with their own distinctive charms and are less frenetic than the Dutch capital. Also growing in popularity is the town of Maastricht in the far south. Undoubtedly, Amsterdam`s Rijksmuseum, packed with priceless paintings, will appeal to culture vultures. Outside of its beautiful cities, the Wadden Islands of the north are a Mecca for yachting enthusiasts, while the flat landscape makes touring by bike easy.